Double Dhamaal the sequal of 2007's original version Dhamaal was released on 24 June 2011. The film was directed by Indra Kumar starring Sanjay Dutt, Mallika Sherawat and Arshad Warsi on lead roles. Double Dhamaal was produced by Ashok Thakeria and Indra Kumar and was distributed by Maruti International and Reliance Entertainment. Directed by Nitesh Tiwari and Vikas Bahl, Chillar Party is a co-production initiative of Salman Khan Being Human Productions (SKBH) and UTV's Spotboy. Releasing on July 8th, Chillar Party is a kid’s oriented film talking about good v/s bad where children along with protagonist “Bheedu” – a character played by Ranbir Kapoor fights against the wicked politicians. Mumbai based post-production company - Pixion studio was at work, a name behind many of the most well-known VFX films and commercials. The team Pixion comprised of Viral Thakkar as the CGI head and VFX supervisor, Sudhir Trivedi as CGI lead, Viresh Raut as FX head, Prasad Padmashali as a senior CGI artist, Chandrakant Shenoy as a Matte painter and Bharat Patil as Composting Lead. Mumbai based Pixion studio's have delivered an entire package of DI, VFX, Film Prints in 4k, 2k Output Media Transfers for Cinevator and Digital Cinema and HD mastering on HDsr tapes for Balgandharva - a Marathi film by distinguished Art Director and production designer of Indian cinema, Nitin Chandrakant Desai. The film is directed by Ravi Jadhav – an icon behind the success of Marathi film, Natrang and is written by Abhiram Bhadkamkar. 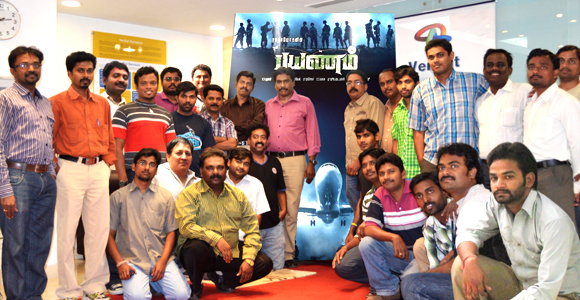 Chennai based visual effects and animation studio Vensat has completed work on recently released bilingual movie Payanam (Tamil), Gaganam in Telugu. Payanam is a real life hijack drama. The film tries to capture the human dimension of events which took place on board ill fated Indian Airlines Flight 814 in 1999. 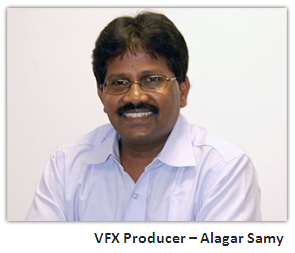 Nagarjuna, Prakash Raj and Sana Khan starrer, Payanam has over 400 shots that have passed through the vfx pipeline. Actor Prakash Raj, who is the producer of Payanam along with Dil Raju is said to have been inspired by a book, 'Flight into Fear'. As in the book, Payanam attempts to unravel the story of a passenger flight which is hijacked by terrorists and their demand of the release of a deadly terrorist. The screen play of the film brings about interconnected drama that taking place between the passengers, the terrorists and the government officials, as captured by Radha Mohan, the director of the film. Radha Mohan is best known for his super hit Tamil films such as Mozhi and Abhiyum Naanum.